Today’s What’s Cooking Wednesday recipe is a new one around this house (but already a favorite! ); it’s based on a variety of recipes around the Internet, and it’s another easy, delicious soup that will impress–just like we like ’em! And even better, pasta e ceci or pasta and chickpeas (“ceci” is pronounced CHEH-chee by the way) is a great cold weather dish and completely adjustable according to your tastes; you can make it as thick or thin as you like and add whatever spices strike your fancy, from basil to rosemary to thyme. Below is my basic recipe, but feel free to experiment! 1. Heat olive oil in pot large enough to hold soup and add onion, garlic, carrot, peperoncino, and rosemary. Cook on low heat until translucent, between 10 and 15 minutes (don’t let this burn). 2. Take out rosemary, which I do because we like a subtle rosemary flavor in this. You’re welcome to keep it in. 3. Add chicken stock and chickpeas and simmer for a half hour. 4. Take out about half the chickpeas and crush into a paste (to thicken the soup). You can do this with a blender/food processor, but I just use the back of a big spoon–fewer dishes (which means less water used to wash them!) and less electricity too. Plus, I’m lazy and this saves me from getting out my handheld mixer, which is annoying to clean. Add this mixture to the soup. 5. At this point, test for salt; this will also let you know how much salt you should put in the water with the pasta. 6. About the pasta, I prepare it separately and then combine the two in serving dishes, but most recipes prepare the pasta right inside the soup. I prefer my way so that if there are leftovers, the pasta doesn’t soak up all the broth (I’ve mentioned this before). 7. After combining pasta and soup, stir in parsley. 8. Serve hot with grated parmigiano reggiano cheese. Robyn, ooh! Looking forward to the tag! Yum! I’ve never used broth, but it would make it quicker, I think. I start with a sofritto and then water, which becomes a veg broth. I also use up the scraps from making pasta usually, unless I haven’t made any since the last time. But this is a really favorite dish and there’s a cafe in town that does it fabulously — better than mone! Judith, lucky you! I’ve never seen this on a menu around here, but I wish I did…would be interesting to try different versions without having to make them all myself. The next time I make it, I’m going to add celery and just use water. Looking forward to it! all I have to say is…I’m hungry! How funny … that’s what I made for dinner last night. Mine still doesn’t taste like my Dad’s yet so I think I’ll try your recipe … Thanks. Joe, well I can’t promise that it’s “Dad good,” but it’s always interesting to try other versions, right? i like this one…….usually i have to go out for a few of the unique incredients, but not this one. maybe i’ll make it tonight, i may try substituting canneloni beans for chickpeas! Wonderful soup! I love pasta e ceci, and you’re so right about the thickness! It’s good to mix it up depending on the temperature/ time of day. I can’t wait to try your recipe! I swear I was meant to be Italian! Soup, soup and more soup!!!! Keep ’em coming! Now that the fall is here I get soup obsessed! Though, I always prefer my soups thick, more like stew…. Hey, there are worse things to be obsessed about! You were right about that vocab. game, it was totally addictive. And all for a good cause! Sweet! Oh, and the soup looks good too. I love soup! I’m also still planning on making your carrot cake this weekend. I’ll let you know if I do. About the pumpkins, I’d send you one if I could. I went to a festival this past weekend where there were 100’s of thousands of carved pumpkins…it was crazy. I’ll have more pictures tomorrow. But go back and take a look at my WW picture again…there’s a hidden message in it. Delicious! This is one of my fav soups, there is a great restaurant in Chuisi that makes it, listed on one of my earliest posts. I’ve never made it myself but you have inspired me. Off to kitchen right now. Novelist, be sure to let me know how it turns out! Amanda, don’t you just love versatility? Robin, yes, there are absolutely worse things to be obsessed about…I’ll see what I can do to get more soups up on here. Amanda, this is so easy, it’s definitely worth a try! I love pasta e ceci. We had it last sunday and even my two kids enjoyed eating it. This is one of my favorite soups and one of our favorite go-to comfort foods. I never added carrots before, but now I will. I’m not normally really big on soups but I gotta say, this one sounds good to me. But then, I do LOVE pasta flavored with a broth of some type so that maybe makes it what appeals to me there. Jeni, to be honest, carrots weren’t my first thought either, but when I started looking around the Internet, I saw that many recipes added them. So I went with it. Mmm…. MM, I knew someone else would find it addictive! Thanks for spreading the word about rice, and the pasta dish looks lovely! This looks great! I’ll have to give it a try. Jen, oh I had no choice but to spread the rice word…to fun! 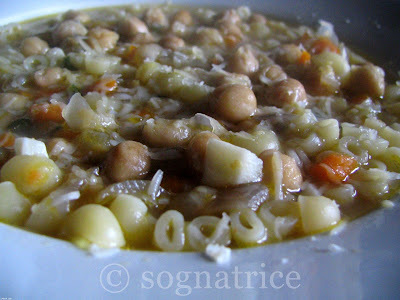 This soup is fabulous… and I didn’t even think I liked garbanzos! Thanks for the marvelous addition to our house repertoire! I’ve had pasta con fave, pasta con lenticchie, pasta con fagioli misti and plain zuppa con pastina, but never pasta e ceci. It sounds delicious! The weather has just turned here (it actually changed ON the equinox), so it’s time to start breaking out the fall foods. Ahh!! I love pasta e ceci!! My dad makes this sometimes!